The RevGear Amateur MMA Gloves are created so that you can train all day, everyday. This 100% Softech™ Leather glove offers the most protection while training, without being restrictive to MMA movements. Shape and size of glove allow you to wear hand wraps underneath. Double lightweight RAM-Force™ technology padding covers first and second knuckles, hand, and thumb. Double padding on top of the hand is split by stitching to decrease hand fatigue. Soft interior lining prevents skin irritation during long hours of use. Extra wrist wrapping protection against scratching you or your opponent while grappling. Sold as pairs. 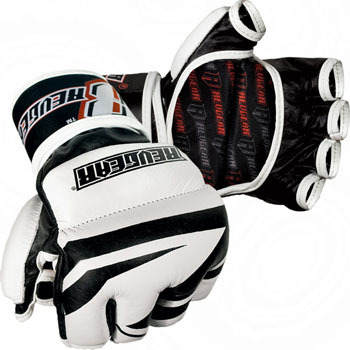 The RevGear Amateur MMA Gloves are available at MMA Warehouse.